When I go out to eat at a Sub Shop, I typically order a Turkey Sandwich with all of the healthy toppings. However, my absolute favorite sandwich is the Philly Cheesesteak. I’m quite picky about it. To me, the meat must be thinly sliced with grilled onions and pepper topped with provolone cheese. I thought I have tried every variation of it but until I started researching the history of the Philly Cheesesteak. Now, I realized that there are quite a few variations especially with cheese. I have never heard of or seen them use Cheez Whiz on the sandwich, yuck! According to Wikipedia, here are the common ingredients in making a Philly Cheesesteak sandwich. The meat traditionally used is thinly sliced rib-eye or top round, although other cuts of beef are also used. On a lightly oiled griddle at medium temperature, the steak slices are quickly browned and then scrambled into smaller pieces with a flat spatula. Slices of cheese are then placed over the meat, letting it melt, and then the roll is placed on top of the cheese. The mixture is then scooped up with a spatula and pressed into the roll, which is then cut in half. Common additions include sautéed onions, bell peppers, mushrooms, mayonnaise, hot sauce, salt, pepper. In Philadelphia, most cheesesteak places use Amoroso or Vilotti-Pisanelli rolls; these rolls are long, soft, and slightly salted. 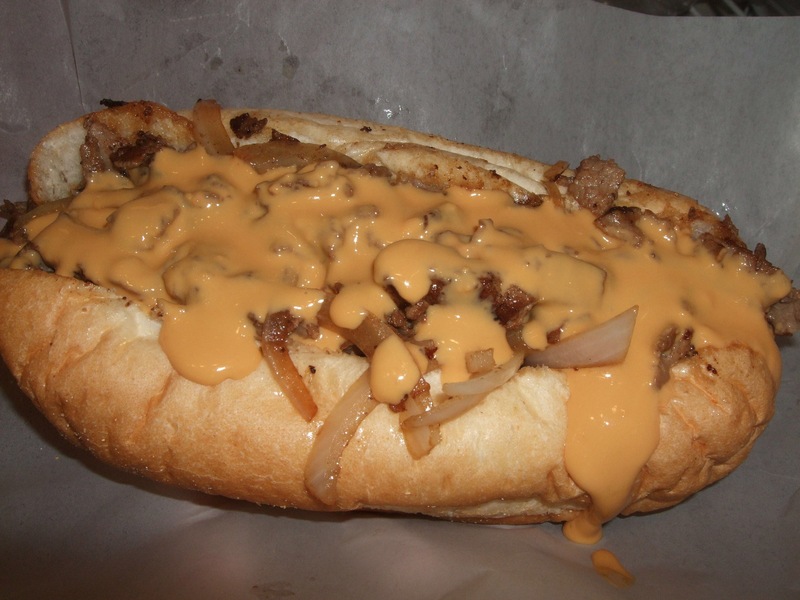 American cheese, Cheez Whiz, and provolone are the most commonly used cheeses or cheese products put on to the Philly cheesesteak. White American cheese along with provolone cheese are the favorites due to the mild flavor and medium consistency of American cheese. Some establishments melt the American cheese to achieve the creamy consistency, while others place slices over the meat, letting them melt slightly under the heat. Now you’ve gone and done it! There is a small Greek diner in Halifax N.S. that serve a Philly cheese steak pita wrap that is absolutely delicious. I used to eat there all the time when I worked in Halifax but haven’t been there since I retired a couple years ago. I just finished clearing last nights snowfall from my driveway and am getting hungry…..I think I’ll head on over there and treat myself. Thanks for the reminder. Oh and cheese whiz? No thank you, even though I have heard that is “the Philly way”. I believe my subs shop make it with chicken too. Just has been a “chicken” to try it out when my fav is with beef. One day, I’ll get brave enough to give it a shot. I tried a “proper” cheesesteak when I was last in Philadelphia and was disappointed. I really didn’t care for the Cheese Whiz.